Actually, a Godzilla Pie (ゴジラパイ) does indeed exist, from a company called Sawarabi STK (I think), and it looks nothing like my American-informed expectations would anticipate. That’s because “pie” in Japanese does not have the same semantic domain as it does in America. Whereas we of the red, white, and blue picture UFO shaped baked goodies with (usually) hot fruity goodness and maybe a side of ice cream, in Japan, a pie can basically mean something more like “pastry”. Thus we get this Godzilla pie that is kind of shaped like an elongated brown heart if you squint at it right. I am inclined to just call it a cookie in my native tongue. Still, if the connection to the English word “pie” seems thin to the average English speaker, then the connection to Godzilla may only be somewhat more obvious. 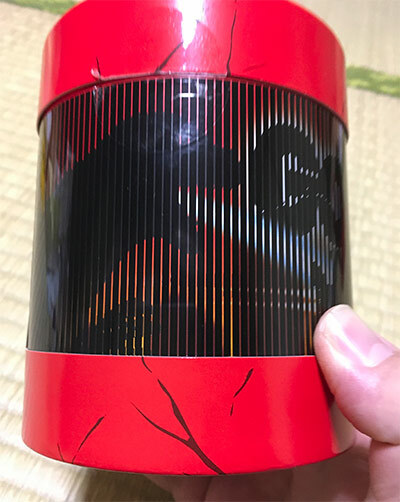 The top cover of the box features a close-up of Godzilla’s black lumpy skin (though the texture looks more similar to the Heisei Godzilla design than Shin Goji). I suppose the individual chocolate-flavoured pies are supposed to look like sections of keloid-scarred dinosaur skin-flesh. Can I just say “toothsome”? So how about the taste? The pastry itself is fairly dry, with a flaky texture, and a sort of melted sugar coating on the crust (each individual pie appears to have been cut from a loaf). The cookies are not overly sweet and, to my Americanized sugar-loving tongue, they come across as being somewhat bland. That perceived blandness probably stems from the fact that Japanese tend to prefer less saccharin overload in their desserts. Probably for the best if your main concern is health, though. One more note about the box, which is basically a kind of bucket. The sides of the circular bucket are printed with a lenticular image of Godzilla and some jets screaming through the air, as well as a big “Godzilla” text in the background. If you turn the bucket in your hand, the jets zoom and Godzilla moves forward and blasts some blue nuclear flame. It’s pretty sweet (sweeter than the pastry itself? Sorry, couldn’t resist!). 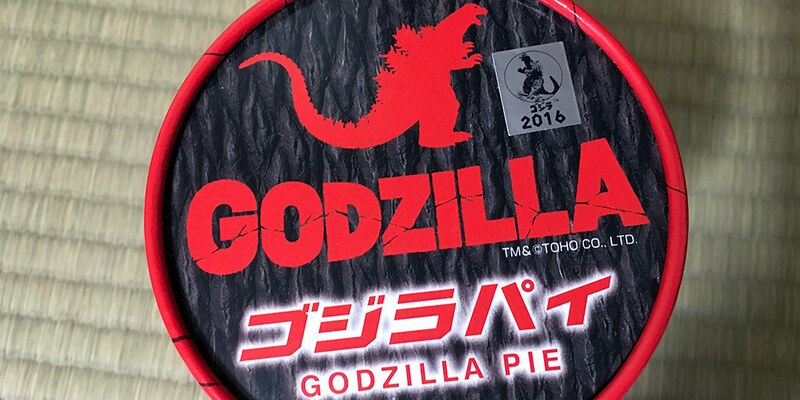 Anyway, I would say the Pie has the second-coolest packaging of the Godzilla treats I have eaten so far, only behind the Godzilla vs. Evangelion Ramen snacks. The Godzilla Arare Crackers runs a close third, though. The Godzilla Pie, like the Godzilla Limited-Edition Yaki, is a kind of omiyage (souvenir) treat. 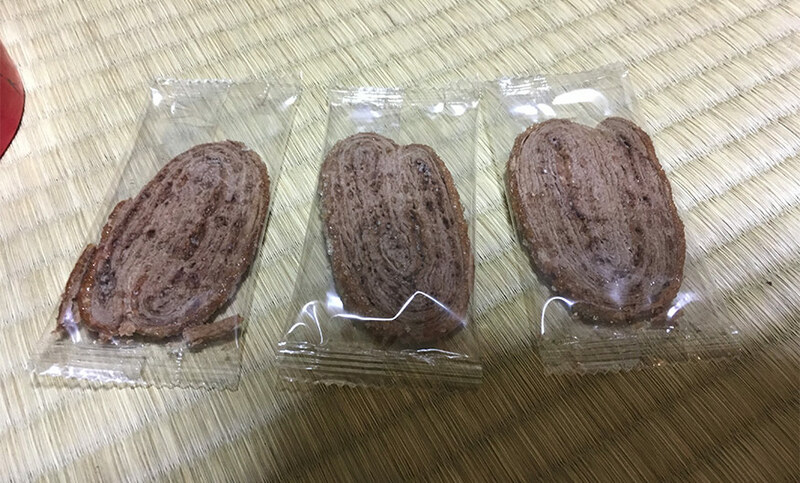 Omiyage, as I mentioned in my previous review, are usually small, often individually-wrapped snacks that fulfil a kind of social role in Japan. When you go on a trip, you must bring back omiyage to share with those you are close to back home. It’s like sharing the wealth in a sense. I like to imagine these Godzilla-themed omiyage for sale on Monster Island. That would be a trip I would like to take. Still, while I enjoyed the G-Pies, they would probably not be my first purchase were I to visit Minilla’s home turf. As a side note, this is not the only Godzilla pie out there. In fact, this is not even the only Godzilla pie that was released in 2016. Another pastry, called a Godzilla Honey Pie, was also sold. 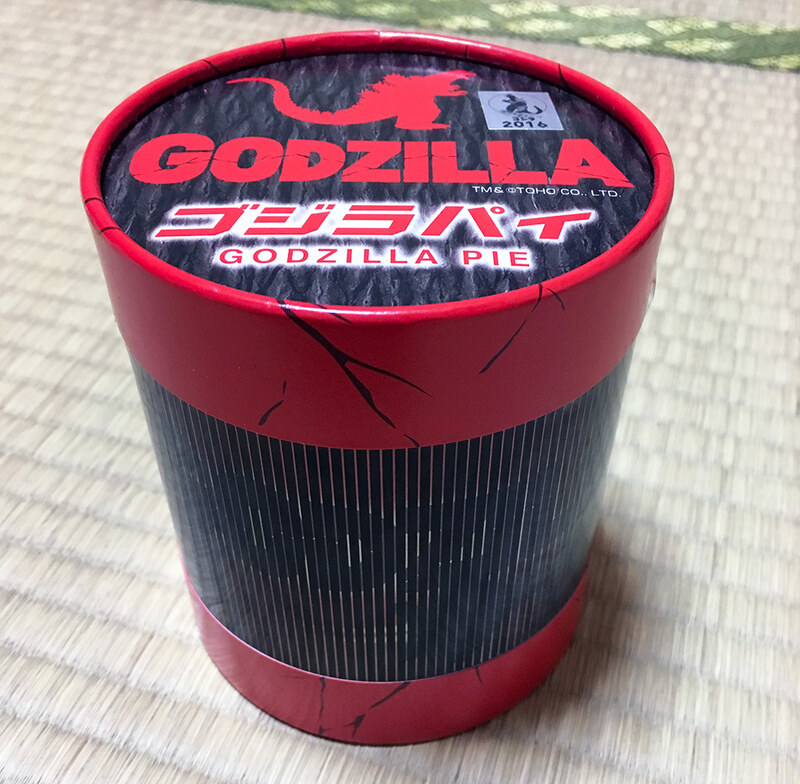 This other pie, also sometimes referred to as a “Godzilla Home Pie” (ゴジラホームパイ), is from Tsubaki and easy to tell apart from this pastry as instead of the attractive red packaging, pictured below, it uses the King of the Monsters from The Return of Godzilla (1984) in front of a blue, cloudy background.